Giraffe the tallest animal in the world and one of the popular Uganda safari tour products is faced with extinction threats following a drastic decline in their numbers with close to 40% noted to have been lost in the past 30 years. It can be noted that though Giraffe can be commonly encountered in the wilderness while on Africa safari including Safaris in Uganda, zoos and in the media, most of the stakeholders are unaware of the fact that these species are facing a silent extinction. This was disclosed by the co-chair of International Union for Conservation of Nature (IUCN)’s Giraffe and Okapi specialist group Julian Fennessy. These beautiful gentle towering gentle giants seem to be overlooked. The Giraffes are far fewer than African Elephants which are below half a million and known to be in trouble. The former have already got extinct in seven (7) countries. According to the IUCN, there were between 151,000 and 163,000 Giraffe populations in the year 1985 but twenty (20) years down the road, only 97,562 Giraffes thrive. During this year’s World Conservation Congress held in Cancun Mexico, IUCN increased the level of threat for thirty five (35) species including Giraffes and lowered that of seven (7) species on its Red list of threatened species. The Giraffe is recorded to be the single mammal that saw change in its conservation status from species of Least Concern to Vulnerable. It is such a touching moment to hear that the animals which once spread in the areas of south and east of Africa with minor populations in west and central of Africa are now sliding to extinction. The trend is attributed to illegal hunting, human wildlife conflict, civil unrest and habitat loss and change due to human activities like mining and agriculture. The wild Giraffes have already disappeared from seven (7) countries including; Eritrea, Burkina Faso, Malawi, Guinea, Mauritania, Senegal and Nigeria according to Kumpel from the Zoological Society of London. 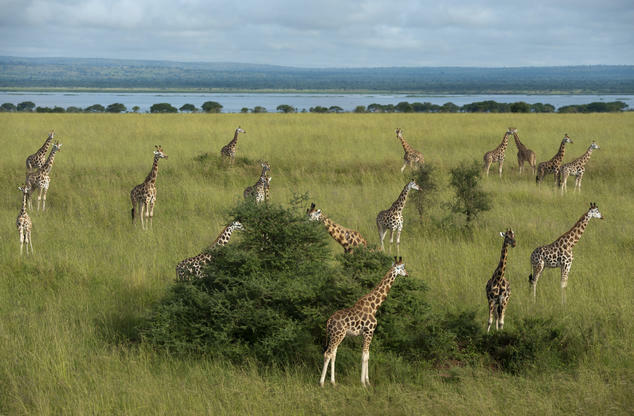 The destination Uganda still feature the highest count of Giraffes in the whole of East Africa and the travellers on Safari in Uganda can visit Murchison Falls National Park, Kidepo Valley National Park and Lake Mburo National Park if they wish to explore them.